Amy Thornton is a contemporary expressionistic painter currently based in Denver. 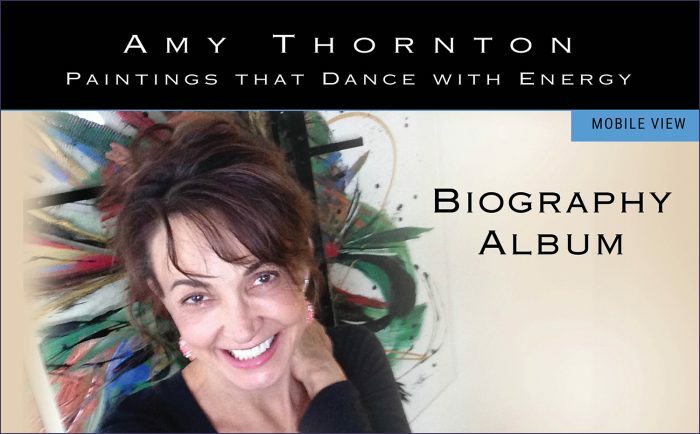 As founder and director of Amy Thornton Artworks for over three decades, she is known for her vibrant, expressionistic paintings on Plexiglas which seem to float in space. Infused with the tension between chaos and order, Thornton’s work celebrates the dichotomies of extravagant energy with the elegance and rich complexities of a quiet presence. Thornton’s classical art studies included the mastery of multiple medias such as pastels, watercolors, oils, and lithography in representational styles including landscape, figure painting and self-portraits. Midway through obtaining her bachelor’s degree in fine arts, she made a dramatic departure from representational art in order to discover and pursue her own artistic voice. Combining contemporary dance and choreography inspirations with her love of action painting, her work continues to capture the essence of dance four decades later. Presented in three distinct formats: Plexiglas style, Nucleus style, and Full-field style—Thornton’s signature work is filled with the visual grammar of vibrant colors, calligraphic lines and richly layered textures. Following years of solo exhibitions and group showings, Thornton’s art philosophy took on yet another departure from the norm. Combining her love of dynamic energy and influenced by her extensive work within team collaborations, she developed a passion for creating highly customized, participatory artworks. Leveraging the Collector’s input with site-specific criteria, Thornton developed a unique niche wherein collaborative synergy leads her painting process. 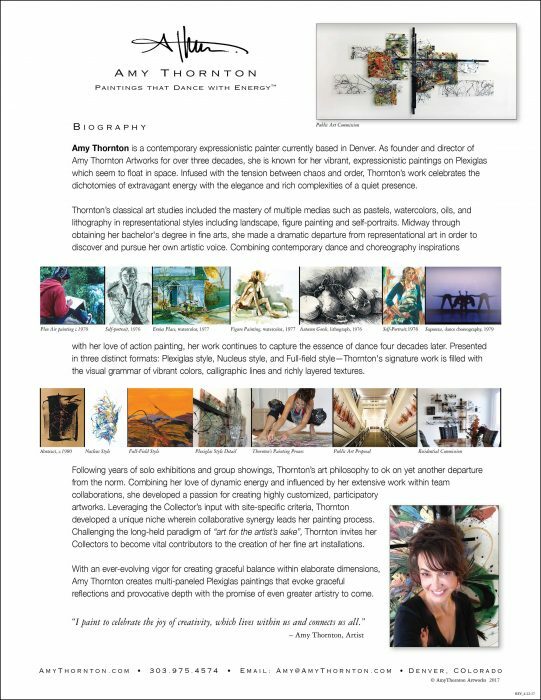 Challenging the long-held paradigm of “art for the artist’s sake”, Thornton invites her Collectors to become vital contributors to the creation of her fine art installations. With an ever-evolving vigor for creating graceful balance within elaborate dimensions, Amy Thornton creates multi-paneled Plexiglas paintings that evoke graceful reflections and provocative depth with the promise of even greater artistry to come. Explore the in-depth history of Thornton’s artistry.